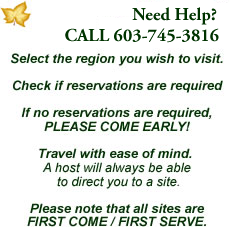 OPEN: The area is open year round with camp sites available on a first-come, first serve basis. Camping fees are full-price during winter and summer months. Snowplowing is provided in the winter. Hancock campground is located on the Kancamagus Highway 5 miles east of I-93, exit 32, and 7 miles respectvely. Hancock campground is a developed recreation areas administered by the USDA Forest Service. A fee is charged for use of this area and is collected through a self-service pay system. The campgrounds are conveniently located near Interstate 93 in the heart of the White Mountain National Forest on the scenic Kancamagus Highway. A variety of recreational opportunities exsist nearby which include; swimming, fishing, hiking, picnicking, sigh-seeing and pleasure driving. 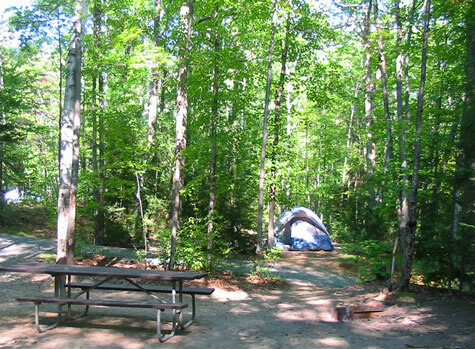 Hancock Campground is adjacent to the East branch of the Pemigewasset River and has 56 wooded sites, each with a picnic table, fireplace and tent pad. A common parking area is shared by 21 sites while the other 35 sites have individual turnouts for parking which will accomodate most trailers and motorhomes. The campground also features solar powered water spigots and 2 flush toilet buildings. A unique swimming hole, known as Upper Lady’s Bath, is located downstream from the campground and can be reached by a five minute walk. The swimming area consists of a relatively calm pool of water with rocky ledge bottom.